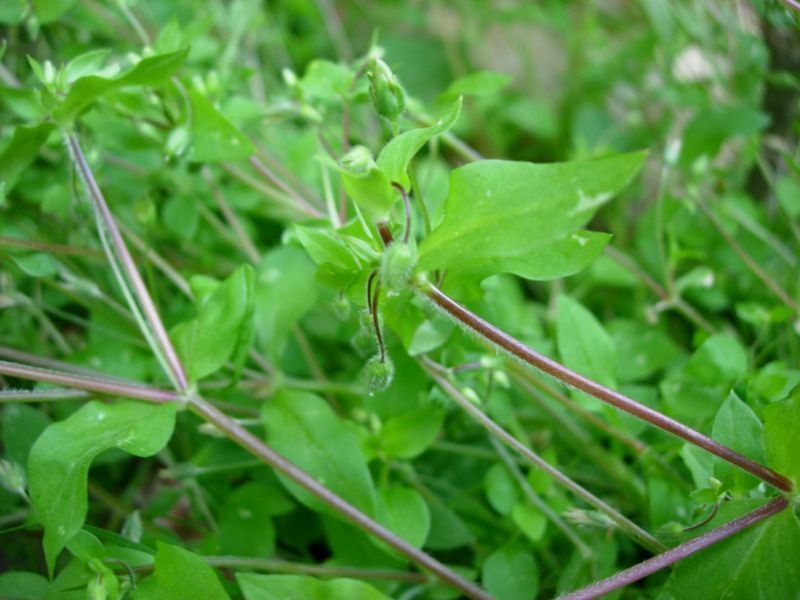 The plant is a common annual weed of both cultivated and bare ground the weed prefers to have a rich soil. It is often found in hedge bottoms or growing in newly seeded areas such as in a lawn. This weed is present from early spring right through until autumn when it will naturally die back with frosts. Seeing Chickweed is usually a good indicator your soil is fertile as this is where it prefers to grow. The plant is a shallow fibrous roots give rise to a vigorous site of prostate stems with single line of hairs. The leaves are borne in opposite pairs which fold in the evening to protect tender new growth. Their leaves have the distinctive point at the end. Seeds are produced very quickly as an individual plant they can produce over 1300 seeds and takes 5- 6 weeks for germination to seed dispersal and can do this up to 4 or 5 times a year. It can also spread by creeping across the ground often under the height of the mower blades where it can swarm out grass. If you have this weed within grassland, we would recommend looking at ‘Hurler’ which is safe to the grass. If you have this problem within a lawn we would recommend looking at ‘Enforcer’. For control around Trees & Ornamentals consider looking at Flexidor.